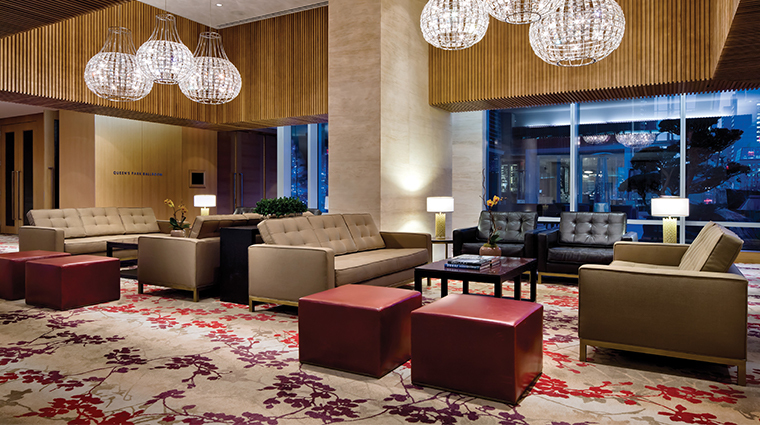 Shangri-La Toronto stands out for its blend of modern luxury with traditional Chinese décor. Throughout the space, the aesthetic relies on natural elements, with plenty of wood and natural stone accents (the 40-ton metal tree statue just outside the hotel symbolizes the integration of nature and city life). The light-filled lobby bar is a great spot for listening to live music offered throughout the day while sipping a craft cocktail, while the hotel’s signature restaurant, Bosk, serves a menu filled with Asian dishes that draw from a variety of cuisines from the region. Rooms at this skyscraper hotel are elegant, mildly contemporary and decidedly streamlined, with marble-clad bathrooms and up-to-the-minute technology. Take advantage of the in-room iPads to order room service, check on the next day’s yoga or spin classes and put in your request for a breakfast reservation without leaving your room. Momofuku Noodle Bar started in the East Village of Manhattan and is still packed to this day. The menu is filled with a variety of buns such as shiitake, reuben, shrimp, oysters and pork as well as noodles like the chilled spicy noodles with Sichuan sausage, black beans and cashews. Indulge yourself in a detoxifying treatment at the Miraj Hammam Spa. Try the Hammam steam rooms and alternate between low-mist and high intensity treatment rooms before your massage or facial. The fitness facility features TechnoGym equipment, a pool as well as a steam room and coed sauna. We also love the cardio boot camp, spin and yoga classes offered. Whether it’s a box of macarons in different flavors or an assortment of fruit-flavored jellies, expect touches like a handwritten note and treats waiting your room. When it comes to packing, less is more, especially if you’re carrying your bag onto your flight. The hotel has already stocked your room with two toothbrushes and plenty of amenities, so you can leave those little things behind. With its extensive list of cocktails and unique presentation as a set of books, the lounge is a great place to enjoy a cocktail, sit by the fire and listen to live music in the evenings (except for Sunday). There’s both an indoor pool and an outdoor terrace for the warm summer days, so don’t forget to pack your suit. 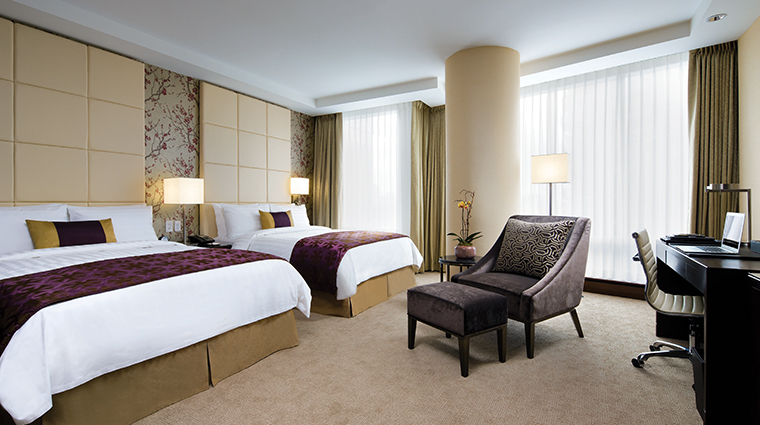 The guest rooms at the Shangri-La Hotel, Toronto are spacious and modern with an Asian influence. Expect floor-to-ceiling windows, textured, oatmeal-colored wallpaper and black-and-white Chinese watercolor paintings that give a nod to the hotel’s Asian roots. On the room’s wooden desk, you’ll find your in-room iPad along with a variety of other useful items like notepads, stationary and adapters for Eastern travelers. A large 46-inch flat-screen LG TV welcomes you to the hotel and you can find the remote inside a brown leather box with a red suede interior along with a list of the channels. 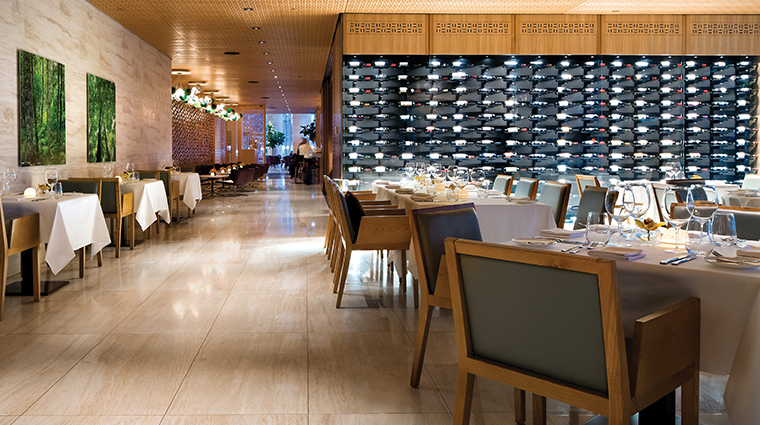 The design style of the Shangri-La Hotel, Toronto blends modern luxury with traditional Asian elegance and history. 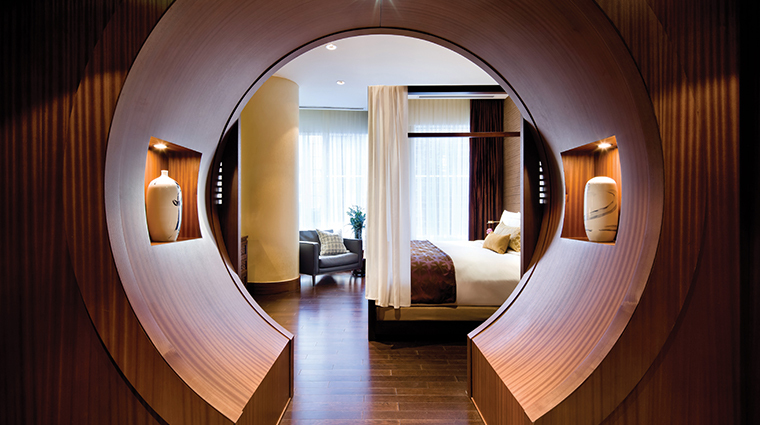 With richly colored fabrics, black-and-white Chinese art and modern amenities, the hotel creates a sense of balance between the needs of 21st-century travelers and the rich history of China. We love the electric fireplace in the Lobby Lounge — guests can cozy up on the off-white leather couches and gaze at the fire or at the ceiling, which is decorated with metal birds that match the birds on the large tree sculpture outside the hotel. That statue weighs more than 40 tons and came directly from China. Welded to that tree are numerous metal birds — the combination of the tree and the birds is said to symbolize the earth and the city life coming together, similar to the way the hotel has blended both the old and the new.